I first came across pianist Ricardo Gallo on the Peter Evans Quartet’s magnificent Live in Lisbon album (Clean Feed, 2010). In a group not short of presence (on drums, the volatile Kevin Shea), Gallo’s boldness of conception nonetheless made his a stand-out contribution. Resistencias (La Distritofonica), the previous, third album from Gallo’s own Cuarteto, was recorded in a studio in hometown Bogotá, Colombia, just six months after Live in Lisbon, and was just as good. I praised it then in a Jazz Mann review for its “serpentine flow of rhythm” and “easy-going grace”, and it remains a favourite. 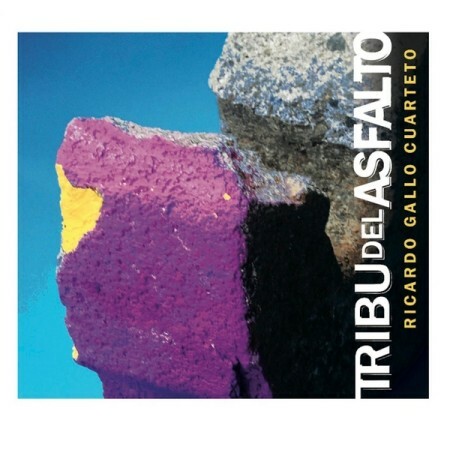 The follow-up, Tribu del Asfalto (La Distritofonica) is a live date, recorded in 2012 during the jazz festival held annually at Bogotá’s Teatro Libre. It’s a more homogenous set than Resistencias, but just as slinkily sinuous. On the earlier recording, percussionist Juan David Castaño varied his instrumentation from track to track, from cajón to tin cymbals, while Juan Manuel Toro switched between electric bass and double bass. Here, Castaño is more settled, and Toro is acoustic throughout. Brief solo spots for each musician stud the flow of the set, within which, for the first five of ten pieces, Gallo’s contributions ripple with luminous sparkle amid resonant percussives and the taut elasticity of mostly plucked contrabass. He develops bolder contours for the quartet’s first of two takes on “Punto de Ilegada”, and shapes an intro to the lyrical and increasingly muscular “Aterrizando, una vez más” from the fresh-spring cascades of his brief intermediary solo. There’s a hint of soul-jazz muscularity to the Gallo Cuarteto sound, but their easy-going accommodation of post-bop and Latin American rhythms and melodies sounds natural and unforced by comparison with the north American pioneers of that sound. Never free-form, this music’s freedoms emanate from independencies amid the rhythmic complexities of interlocking lines, and from each musicians’ mutually-sympathetic liberality with bold modal and chordal harmonies: witness the relaxed reprise of “Punto de Ilegada”, which wraps the album on a note of jaunty insouciance. Marvellous. This entry was posted in Album and tagged Ricardo Gallo, Tribu del Asfalto. Bookmark the permalink.